A geolocation system is a savings and productivity generator for your business because it acts directly on spending items that you could not control and quantify before. GloboConnect processes the data when they are transmitted and returns them to the different services of the company, in an immediately readable form, formatted for the decision. Everyone gets the clear vision needed to act. The Chief Operating Officer knows at every moment where are the agents / providers and what they do. He finds immediately the closest vehicle to an intervention. He is automatically notified of an abnormal event. He has a global view which allows to find alternatives solutions, cheaper and more efficient. He instantly transmits his new instructions. The company can easily inform its customers (“what is the current situation of my delivery ?”, “what is your technician doing ? ), or even prevent if behind schedule. 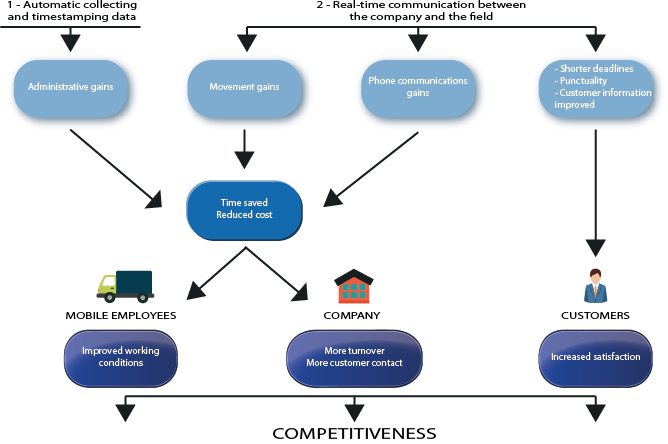 The manager regularly receives synthetic statements, based on accurate and objective measures : average response time, index of punctuality, time spent by customers, in business and on the road, vehicles use rates, ecodriving grades etc… He always has adequate data to guide its strategy and set goals.